The simplest solution to transition your baby from Swaddle UP™ to arms free - all while maintaining your baby's cherished sleep routine. *Ages, weights and child heights are approximate. For best fit result please select size according to your child’s weight, not their height or age. You must stop using the Swaddle UP when your baby shows signs of trying to roll and transition to Swaddle UP 50/50. *Ages, weights and child heights are approximate. For best fit result please select size according to your child’s weight, not their height or age. You must stop using Swaddle UP 50/50 with the wings attached when your baby shows signs of trying to roll and transition to ‘arms free’ sleep. *Ages & child lengths are approximate. For best fit result please select sizing strictly according to your child’s current length, not their age. For delivery to the Scottish Highlands, any islands (including Isle of Wight, Scilly Isles and Channel Islands), Northern Ireland, Republic of Ireland, Europe and the rest of the world, delivery charges apply to all orders.!!! We are unable to send our larger/ heavier products to BFPO addresses. Please Contact Us and we will do all we can to get what you need to where you need it. This is only available for selected lines in certain countries, and a variable delivery charge will apply, dependent upon your location and the weight and volume of the order. The charge will be calculated during the checkout process, and you will know of the full delivery charges before you confirm your order. Where the item(s) ordered are all in stock, 99% of orders are dispatched from our warehouse within 24 hours. For most of the UK mainland, you can expect your delivery 2 to 5 days after placing an order (depending on whether your order is dispatched via courier or Royal Mail). Deliveries further afield may take considerably longer. In a hurry? For most UK mainland orders, just £5 extra pays for our premium Next Day delivery service. The item needs to be in stock, and ordered before 1.30pm (UK time). We will fast track delivery for the next working day (excludes weekends and bank holidays). We cannot guarantee a next day service for orders that require customisation or Gift Wrapping. We cannot offer next day deliveries to more remote areas such as the Highlands of Scotland, or deliveries that have to cross water, though our premium service speeds things up as much as we can. Specifically!. Timing dependant on Country, Location, weight &/or volume of order. We take the best possible care to make sure that your order and its packaging leaves our warehouse in good condition. If when your delivery arrives, you find that the outer packaging is damaged and you suspect that the products inside are also likely to be damaged, you should not accept the delivery and should hand it back to the courier to return to us. If you decide to accept a delivery where the packaging is damaged, you must inform the courier in writing of the damaged packaging when you sign for the delivery, take a photo of the damage before opening your parcel, and Contact Us immediately. For extra information on deliveries, please click here to view our full Terms & Conditions. Claims for lost outgoing parcels cannot be made until enough time has passed to allow to delays in the post, generally 15 working days. We also ask customers to ensure that they make their claim within a reasonable length of time. Claims cannot be processed if reported to us 30 days after the original order date. Contact us as immediately if your parcel has not arrived in the timescale set out when ordering and we will advise you of next steps. You may be advised to complete and sign a non-receipt of delivery form whilst we set investigations in progress. This will help us should we need to report the incident to the Authorities at any stage of the investigation. 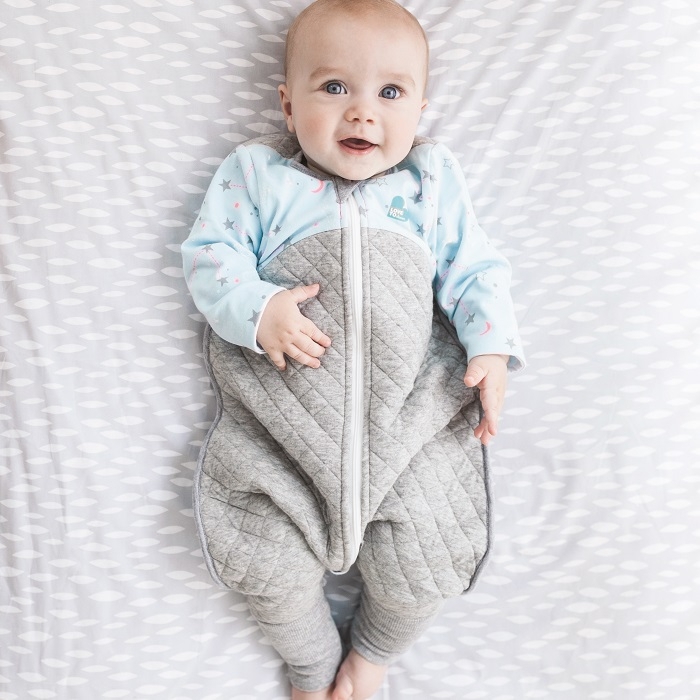 The Love To Dream Sleep Suit™ allows additional mobility & freedom, versus traditional sleep bags, making it perfect for active babies & toddlers who are always on the go. The ‘2 in 1’ feet can be covered for bedtime & uncovered for play time. The Sleep Suit has long sleeves to keep your little one’s arms warm & mesh vents under the arms for increased airflow & better temperature control. Designed with a lighter upper chest fabric to help reduce the risk of overheating. Please view our tog rating chart for information about what a tog is and how the tog rating system works. What TOG do i need? By leaving this question, you give us consent to use your data to be displayed on the website, you will need to contact the site administrator to get this removed. Q: How do I know which tog will be best for my baby? A: The Original is suitable to use between temperatures of 17�C and 25�C, whereas the Warm is suitable for temperatures between 16�c and 20�c. All swaddles come with a guide on the packaging, as a guide for what the baby should wear, in order to keep them at optimum temperature. You will also be able to find the temperature guide on the website. Q: Should I buy the Warm or Original? We give you 12 months to return your order to us for a full refund. We’ve made it as easy as possible – just follow our simple 3-step returns process. The goods do need to have been looked after carefully, and returned unused, in the original packaging.